The Beatles‘ best-selling 1 compilation will be reissued and expanded in November as CD+Blu-ray and CD+DVD sets featuring remixed stereo and surround sound and for the first time fully restored full length videos for each of the 27 number one singles. The original promo films, classic television appearances and other carefully selected videos spanning the band’s history have been painstakingly restored with 35mm negatives scanned in 4K and digitally restored along with other processes such as frame-by-frame cleaning and colour-grading. This has created outstanding standards of clarity and quality. The standard two-disc editions (CD+Blu-ray or CD+DVD) feature 27 videos, with bonus content of Paul McCartney audio commentary on three films and and Ringo Starr filmed introductions for a four of them. These can also be purchased without the CD element. 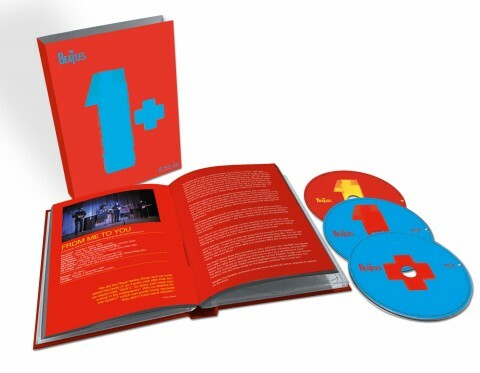 A deluxe three disc set, 1+, offers a second video disc (dvd or blu-ray) with a further 23 videos including Rain, Strawberry Fields Forever, A Day In The Life, Hey Bulldog, Don’t Let Me Down, Free As A Bird and Real Love, along with many alternate promos of classic tracks including Paperback Writer, Day Tripper and Hello Goodbye. In total, the deluxe edition gives you over 200 minutes of video content via 50 individual films (20 of these weren’t used at all in The Beatles’ Anthology, with others used only in part or in alternate edits). This deluxe 1+ also offers enhanced packaging and is presented in an expanded 124-page illustrated hardcover book with notes by music journalist Mark Ellen and detailed track/video annotation by music historian and author Richard Havers. Exciting though this video content is, the sound is a very big deal since all editions of the new 1 reissue feature newly created stereo and 5.1 Dolby Digital and DTS HD surround audio mixes, produced from the original analogue tapes by Giles Martin with Sam Okell at Abbey Road Studios (Jeff Lynne and engineer Steve Jay have remixed Free As A Bird and Real Love). The CD with these packages uses the new stereo mixes, not the 2009 remasters (a 2LP 180g vinyl package will follow). 1 and the deluxe 1+ are both released on 6 November 2015. 50 ans pour avoir le bon son (remixé) sur un support video...bon sang, mais bien vu quand même, bien entendu!